We build custom computer systems. We are available 8AM-8PM 7 days a week! We are a small, reputable, reliable computer company based in Tauranga. We provide businesses, gamers and home users from all over New Zealand with I.T gear and support. Instead of waiting days for someone to reply to your queries from one of the larger companies, our sales manager Ben replies quickly, usually within an hour, which allows you to get fast responses to questions, issues and purchase arrangements. Our rates/prices are excellent as we have low overheads & genuine suppliers, and we use only the best quality components to safeguard you for the future (guaranteed by the warranties we provide on our systems). We pride ourselves on 100% customer satisfaction and low prices. Please see our 100 reviews at the bottom of this page. From entry-level home/office PCs to the amazing high-end computers. We can build you anything to cater to your personal and business needs. Any other computer related issues/requests? Email us and we will get you sorted. Awesome PC. Great company. Would definitely recommend. Very highly recommended. Ben was really quick with communication. He's happy to accommodate what you want in the system, uses quality parts and his pricing is extremely good. This man is an expert trader, super easy delivery and really professional. Great prices, I couldn't recommend him enough. A+++. I purchased a custom gaming pc with Ben and I couldn't be happier. Communication was excellent. Was given sound advice about different parts and how to save money on the build. 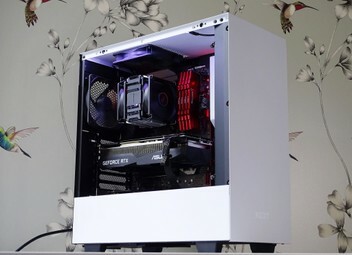 The build itself was nice and clean - like a piece of ' art '. I Highly recommend Ben - Great service - Great Deal - Awesome computer!! Ben is an absolute legend. Helped me tremendously with my new PC. Great communication and a great guy do deal with! Highly recommend if looking for a new custom PC or PC components in general. Awesome service, very fast and cheap. Would definitely recommend to purchase a system from here! Great deal for a great PC! Thanks for the trade! Superb service, outstanding communication, made purchasing this computer so super easy and effortless. Zero stress, would highly recommend this trader and the team at Compulsion Tech. 10/10 from me. Very happy with my purchase. I did have some issues initially but they were fixed at no cost to me. The seller is very quick at communication and listen to the buyer. Thank you for my awesome gaming machine! I can easily recommend this guy. Was very patient and accomodating to my needs. He delivered very well as he promised! Can easily recommend Compulsion Tech. They helped me with my Custom PC and all for a great price also. Super helpful and would do business with them again. Thank you again.